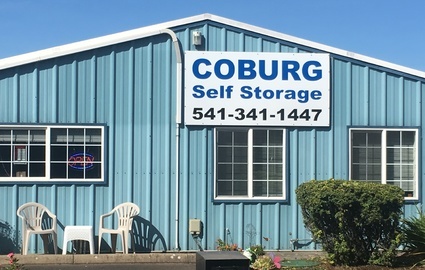 Coburg Self Storage is just north of Eugene, OR and conveniently located off of I-5. We are just a short drive from Springfield, Coburg and Harrisburg. Our location also makes us an affordable storage solution for students at the University of Oregon. We’re 2 miles north of Beltline on I-5 - take the Coburg exit, a left on Van Duyn, a left on Roberts, and a right on Roberts Court. Compare our prices! Call us today to discover just how easy it is to free up some space at your home or office with our self storage units. You won’t have to lug your stuff through hallways or struggle moving furniture across a parking lot with us. We offer drive-up access to all of our units to make your move an easy one. We also have dollies, handcarts, boxes and other moving supplies to help you and your valuables make the move to Coburg Self Storage. Our self-storage units are conveniently located just off I-5 in Eugene, OR! We offer units with drive-up access and secure RV, car, and boat storage at our fenced and gated facility. Contact us to get started!